Group Travel Management & Marketing made Easy. "Spirit House runs regular small group tours to Asia and India - YouLi allows us to manage all the ‘behind the scenes’ planning, logistics, sales, payments and customer contacts from one location - this has saved us countless hours and simplified the entire process from communicating with customers to collecting passport info." "YouLi makes it easier to communicate our detailed schedule our students in real time,so they know exactly what’s coming and know they have done everything required to be prepared." "I used YouLi as the Traveller Portal for my Cultural Tour of Uzbekistan and it saved me so much stress. It gives a deeply personalized experience for each of my participants to interact with me in ways that I get to dictate, and this absolutely makes less work for me. For years I have been creating Cultural Tours, Professional Visits, and Women in the Arts & Business Missions to Arab and Islamic countries. I intend to run all my trips through YouLi from now on!" 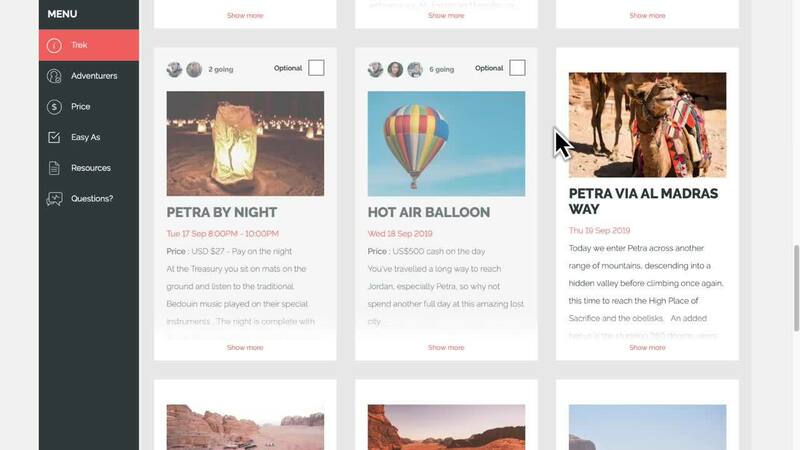 "We post our sample itineraries on YouLi because we think a truely unique trips should have an online booking experience that matches the quality of the real-world travel experiences we deliver. We love the flexibility and ease of use, so much better than typical travel software." "We use YouLi Quotes to publish sample itineraries to our website and capture leads which are then converted to trips - all in one place and without needing a website developer"